Supplied as established plants in 7cm pots. Dormant in winter, so no leaves showing Oct-April. 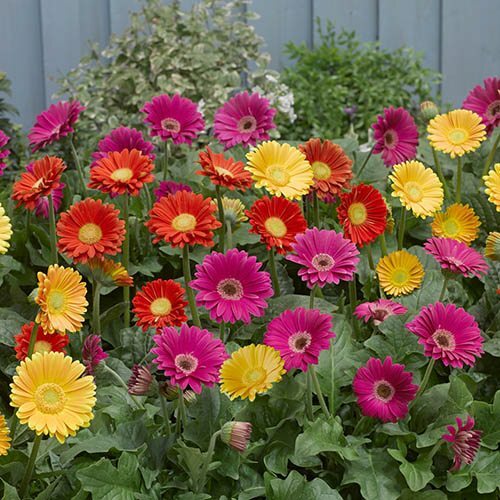 The world's first Hardy Gerbera in a range of bright, zingy neon colours, the Garvinea series was originally launched to great acclaim across Europe. Bringing the popular florists' gerbera flowers to a garden perennial, they give an amazing 7 months of colour from spring to autumn every year - not many plants can do that! Well, now they have got even better. The breeders in Holland who created them have developed an improved series with much bigger flowers, and even longer lasting performance. called the 'Sweet Series', we are delighted to be able to bring you some of the limited stock. Retaining the same benefits of being winter hardy to around -8°C (although avoid severe winter wet), and flowering for 3 seasons of colour, their highly distinctive flowers simply keep coming - up to 50 on a 2-year-old plant. We love them in traditional terracotta pots, in the sun, or grown in well-drained borders at the front, where they will amaze you with their persistence of flowering and sheer flower number. In winter they are herbaceous, so die back completely underground, to emerge bigger and better next year. Supplied as 3 established plants in 7cm liners, 1 each of the varieties listed, ready to plant straight in the garden. NOTE: Dormant in winter, so no leaves showing Oct - April. Plant in full sun and protected from cold winds. Garvineas prefer fertile, well-drained, moist soil that has been dug deeply. When planting set the crowns slightly above the soil level then firm back around the soil, using your hand for small clumps and your heel on larger areas. Water in well to settle the soil and prevent drying out.